It’s almost the end of the year and you know what that means! But we’re talking about your dental insurance! 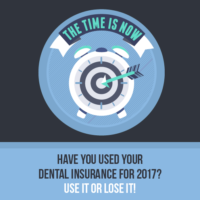 Did you know that at the end of your coverage year, your unused dental benefits go to waste as your plan renews? Most benefit plans renew starting January 1st so you are left with just a little over two more months to utilize your benefits. You paid for them, don’t let them go to waste! Continue reading to find out our take on how you can maximize your remaining dental insurance benefits! How do I make the most out of my remaining dental benefits? Have you had your biannual dental cleaning? Most insurance plans cover cleanings at 100%, which means zero cost to you. This by far is the easiest way to use your dental benefits, especially if you don’t have any outstanding issues with your mouth. A professional cleaning takes only about an hour of your time and helps maintain the condition of your teeth in the long run. Are you aware of how much you have left? If you’re a patient who regularly visits for the dentist for either cleanings or treatment, know how much you have remaining in your plan. If you still have benefits available and treatment to be scheduled, do so before the end of the year. Utilizing what you have now vs. waiting for the future could save you hundreds of dollars in the long run. Don’t delay, call us today! Do you have extra funds elsewhere that can be used? If you have a health savings account (HSA) or flexible savings account (FSA), often times they could be used for your dental procedures. Similar to your dental benefits, any unused amount doesn’t roll over and money doesn’t grow on trees. Utilize your other spending accounts on your dental treatment to cover any unmet need. Do you have any unscheduled treatment on file? Maybe you haven’t scheduled due to funds or maybe the lack of time and inconvenience. Whatever the reason, the end of the year is a busy time for most individuals, especially with the holidays rolling around. If you have any outstanding treatment and leftover benefits, use them before you lose them! The longer you wait to attack these issues, the worse it can potentially become — which will be more costly in the long run. If you would like an individualized care plan on how you can personally maximize your remaining dental benefits, give us a call at 206.440.0065. We’re open Monday – Thursday from 8AM – 5PM!